I like this quote, not because it is a well-crafted aphorism, but because of its babbling exuberance – it conveys a rare kind of enthusiasm. 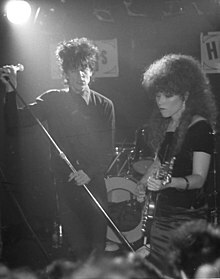 For me it conjures an image of Lux Interior and Poison Ivy Rorschach, prime movers of ‘psychobilly’ band the Cramps, wandering the city like harmlessly monstrous goth-burlesque flâneurs, stumbling upon the strange artefacts of trash culture that fuelled the lurching monster of their music. 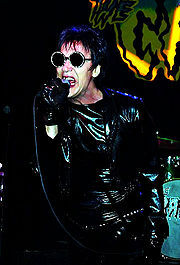 Revisiting the Cramps’ twisted world has been sad, as Lux Interior died earlier this year. It seems like a blink of an eye since I was reading a review of ‘Gravest Hits’ in the NME (now changed beyond recognition), getting a 26 bus (route now largely that of the 1/1a) into Brighton, buying the record from the Attrix shop (long since closed) managed by Rick from the Parrots (sadly no longer with us). Everything persists – at least in electric ghost form – I could probably download the Cramps’ entire catalogue in less time than it took to walk to the bus stop. Curiosities such as their performance at the California State Mental Hospital in Napa (lovingly recreated as the movie File Under Sacred Music) are there on YouTube, to be turned on like a tap. And at the same time nothing remains – my memories of seeing the band live will fade as I do, feedback fading into the background hum of amps on an empty stage. For a long time, I haven’t had their music as a soundtrack. Perhaps my existence as an amiable suburbanite and vaguely serious professional dude hasn’t needed such a maniacal undertow. I gather that the Cramps struggled with an (understandable) view of them as a comedy band. But they took their trash seriously, pursuing their vision with a relentless intent and utter conviction.